China is now piloting a top-down campaign against so-called "family corruption" in five provincial-level regions. The regions' Party chiefs are required to lead other officials in preventing their family members from running private businesses. However, some argue that the key to eradicating family corruption lies in reforming the way power is exercised. Xiao Bei (pseudonym), a guanerdai (the children of powerful officials) who works in the government in Urumqi, capital of Northwest China's Xinjiang Uyghur Autonomous Region, feels his life is about to become more difficult. On Friday, senior officials sat down with him and several other guanerdai colleagues, inquiring about their private business. "We were asked to sign a contract, promising not to participate in any business or commercial activities," Xiao told the Global Times. "They also took our passports." Xiao is the son of a department-level cadre in Xinjiang. His passport was taken away just four days after the central leadership announced it was piloting new economic restrictions on officials and their relatives in Beijing, Guangdong Province, Chongqing and Xinjiang. Some regions outside the pilot program have also stepped up similar efforts. A bureau-level official from a city in North China's Hebei Province revealed that all the city's officials were recently made to submit information about all their family members, including their names, jobs and ID card numbers. According to the Procuratorial Daily, a newspaper under the Supreme People's Procuratorate, 80 percent of government corruption cases involve the officials' family members. "How to reverse this trend has become a key issue for the new leadership, so they can win the hearts of the masses and enhance Party cohesion," Li Yongzhong, an anti-graft researcher, told the Global Times. Some officials' relatives have complained that it's unfair to completely deprive them of their right to do business. 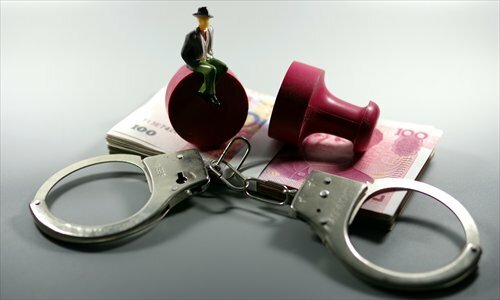 Experts told the Global Times that corruption will only be eliminated if a more decentralized supervision system is established through political reform, and that broader central supervision is unlikely to be effective. On April 18, the Central Leading Group for Deepening Overall Reform held its 23th meeting since its establishment in November 2013. Presided over by President Xi, the group approved applying economic restrictions that were first tested in Shanghai to the four new regions. Family members covered by these new limitations include officials' spouses, their children and their children's spouses. "The regulations must be enforced firstly, strictly, and from top to bottom," according to the meeting's resolution, the Xinhua News Agency reported. It also ordered a permanent national mechanism be implemented later. On April 22, Guangdong Party and government offices endorsed a document that called for building "proper" government-business relations. It lists a number of things that are now banned, including officials getting jobs for their spouses, children or children-in-law, and private companies providing financial management services for officials and their families. These kinds of restrictions are nothing new. The central leadership has issued at least 20 such documents since the 1980s, but most of them have been proven ineffective. Li Yongzhong, former deputy director at the China Discipline Inspection and Supervision Institute, claims that this time it will be different. The chiefs of the five chosen provincial regions are all from the 25-member Political Bureau of the 18th CPC Central Committee, he noted. "These top leaders taking the lead to implement the regulations will set a good example for the other places," Li told the Global Times. In addition, Shanghai, Beijing and Chongqing are major municipalities, Guangdong has topped the national GDP ranking while Xinjiang's priority is maintaining stability, he told the Global Times. "If the regulations can be well implemented in these areas, they can be in other places," Li said. Since a sweeping corruption crackdown was declared at the 18th CPC National Congress in November 2012, more than 120 provincial-level or above officials and thousands of lower-level officials have been sacked, according Xinhua. Many of the highest-profile corruption scalps, including Zhou Yongkang, Chinese ex-security chief and former member of the Standing Committee of the Political Bureau; Bo Xilai, former Chongqing Party chief and Political Bureau member; and Ling Jihua, former minister of the United Front Work Department of CPC Central Committee were all linked to family corruption. According to qq.com, about 10 relatives of Zhou were allegedly involved in corruption, including his brother, his son and daughter-in-law's parents. An investigation by The New York Times showed that Zhou's sister-in-law, his son Zhou Bin and Zhou Bin's mother-in-law held assets in at least 37 companies, worth about 1 billion yuan ($160 million). Xiao Bei said it's common for guanerdai like him to use their parents' connections to get ahead. "Many do business secretly. The companies they are behind can easily win public contracts," he said. "There's a guy who has been lobbying me to run a business with him, saying that he will be in the foreground while I just need to be in the background," he said. But he claimed that he rejected this offer as his parents have warned him away from getting involved in business to avoid trouble. According to a statistic released by the local procuratorate of Tai'an, East China's Shandong Province, among the 37 officials they have charged with graft, 34 of their wives received bribes on their behalf, according to a June 2015 Procuratorial Daily report. "Behind nearly every corrupt official there are businessmen," said He Wenkai, a deputy procurator-general of the Fangchenggang People's Procuratorate, the Guangxi Zhuang Autonomous Region. "It's easier for bribers to approach officials' relatives and it's easier to hide giving them bribes." During the corruption trial of Liu Tienan, a former director of the National Energy Administration, he apologized for the fruits of corruption he showered on his son. According to procuratorate charges, Liu Decheng owned a 300,000-yuan car when he was 21 and 7.5 million yuan was deposited in his bank account the following year. By the age of 25, he was a multimillionaire. Between 2007 and 2011, he received an annual salary of 1.2 million yuan at a State-owned automobile group without having to do any work. "The root reason for family corruption is an improper power structure. 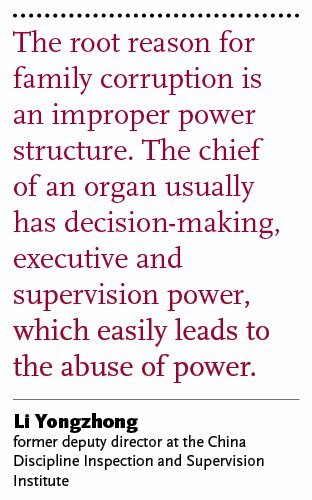 The chief of an organ usually has decision-making, executive and supervision power, which easily leads to the abuse of power," Li noted. He thinks the fundamental solution to eliminating corruption is reforming the power system but he believes the trial regulations are still worthwhile. The founding fathers of the People's Republic were apparently less generous with their relatives. According to Niu Baoliang, assistant professor at the China Executive Leadership Academy Jinggangshan, a training base that drills CPC history, Party building theory and revolutionary tradition into its students, Chairman Mao was particularly strict with his children. He didn't give his son Mao Anying a government post and insisted he work in villages, factories and in the army, Niu said in an article published in the magazine Chinese Soul. Since reform and opening-up started in the 1980s, civil service salaries have lagged behind the incomes of businessmen. Officials, eager to see their wallets get fatter as China's economy bulks up, started to use public resources for their own benefit. In 1985, the CPC Central Committee and the State Council jointly released a decision which stipulated that all the children and spouses of officials at the division and county level or above were forbidden from running private business, according to people.com.cn. This was just one of dozens of similar central leadership orders. But the repeated orders and instructions failed to suppress family corruption, lamented Zhu Lijia, a professor at the Chinese Academy of Governance. "Compared with previous broad-brush bans, the restrictions carried out this time sound much more feasible," Li said. According to the Shanghai regulations, the spouses of local officials are banned from running businesses, whether they are individually owned or partnerships, unlisted companies or enterprises registered overseas but operating in China. The children and children-in-law of municipal leaders cannot run a business in the city. Other officials' children and children-in-law cannot run businesses in areas and industries under their relatives' jurisdiction, the regulation says. Officials must report the business activities of their spouses and children to higher authorities which will then spot check the information of 20 percent of officials annually. Violators face two choices: asking their families to quit their business or they can resign themselves. According to Han Zheng, Party chief of Shanghai, the city has checked up on 1,802 officials' families and found violations related to 182 officials. 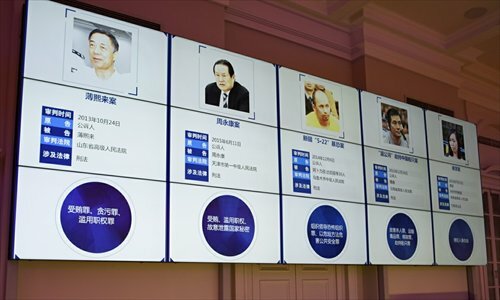 Most of the officials' families chose to quit their business, ten were dismissed from their posts, 10 were transferred to other posts, one resigned and three others were investigated for suspected corruption, Han disclosed in March. It is unknown whether or not the four new pilot regions will exactly follow Shanghai's example, but experts said measures are likely to be similar. Amid public applause for tightened corruption efforts, there are also complaints. Xiao Bin who has lots of guanerdai friends said many of them complained. "Some said they have to move outside Xinjiang to do business, but it's hard for them to start a business in an environment they are completely unfamiliar with," Xiao said. It is estimated that more than 1 million people will be affected by the new rules if they are applied nationally. According to Li Yuanchao, head of the Organization Department of the CPC Central Committee, there are more than 600,000 cadres above the county level in China.